After many, many years of wanting to build a 1/25 scale version Tom Daniels Mean Maverick, I finally got off my duff and did it. It all began with the re-issue of the old MPC Multi Maverick. It looked reasonably close to the Mean Maverick with a few differences that I felt could be relatively easy to overcome. 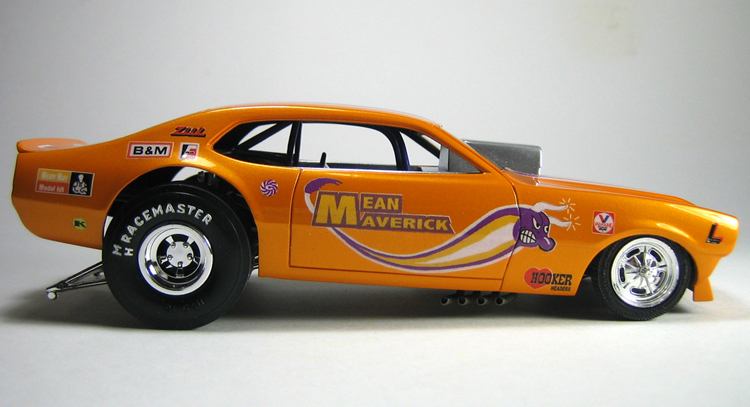 I was then able to obtain a set of scaled down Mean Maverick decals from Dave Van over on the Coffin Corner. Finally I had some "Radiation Flow" orange paint leftover from Fritz's Roswell Rod build that was about to go bad. So I set about attempting to translate the 1/12th scale kit to a more manageable 1/25. 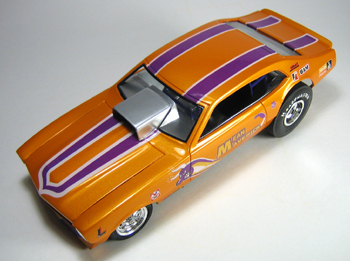 Basically I didn't really do all that much, the biggest change was replacing the Multi Maverick snorkel hood with a stock Maverick hood taken from a beat up Johan 1970 Maverick promo. I did modify the grill and headlights to look more like the Mean Maverick by filling and blending everything together rather than leaving it like a stock maverick as the Multi Maverick is designed. 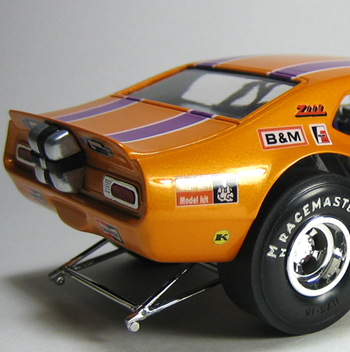 I also removed the “B” pillar as the Mean Maverick body doesn’t have this detail. And finally the rear bumper was blended into the body as well. Once all of the body work was completed I coated it with Plastikote light gray primer and filled and sanded it smooth in preparation for paint and decals. The body was first base coated with white over which the “Radiation Flow” orange pearl was sprayed. Once dry the decals we applied and went on nicely with the exception of the roof stripes which were about a half inch too short. Fortunately the trunk stripes were about a half inch too long so I was able to piece together enough to complete the stripes. If you look closely you can see the seem near the rear of the roof. 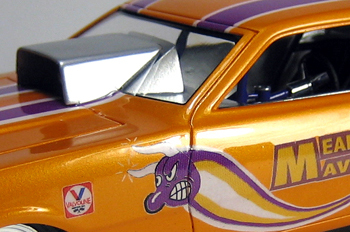 Once the decals were dry, I over coated the body with clear two part urethane to give it a nice high gloss finish. 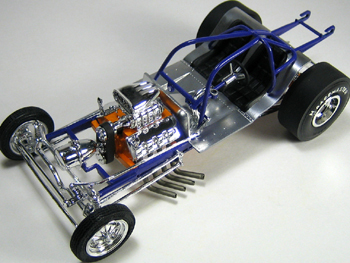 The engine and rear axel were also painted the same color as the body to give it more of a show car look. 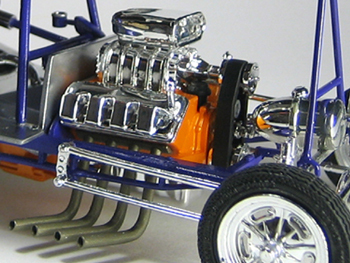 The chassis and roll cage were painted Tamiya Purple which was a pretty close match to the stripes, but for some reason photographs more blue in tone. 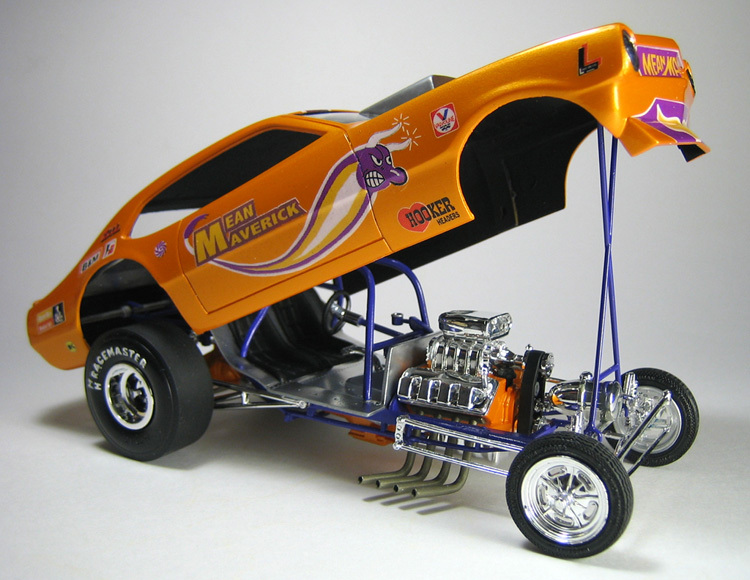 If you compare my build to the actual Mean Maverick there are several discrepancies, but its close enough for me. 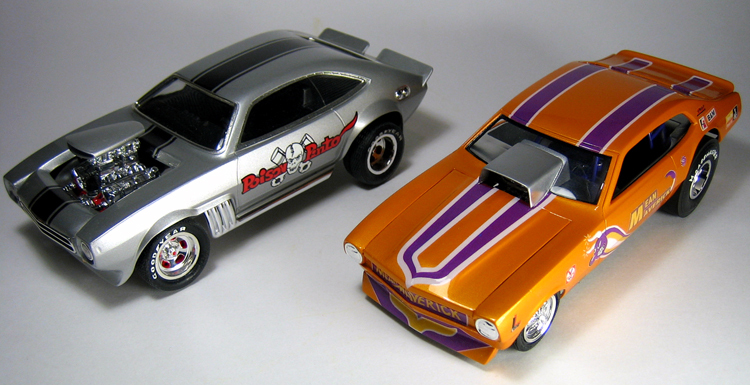 And it looks so cool parked next to my Poison Pinto!